The mandible of Khoratpithecus piriyai from Chaimanee et al. (2004). Scale bar equals 1 cm. The subject of today's Taxon of the Week post is the Ponginae. Rather than comment directly on the prolonged, bitter and largely pointless arguments on ape beta taxonomy, I'll simply note that for this post I'm restricting Ponginae to the clade including the modern orangutans and fossil apes closer to orangs than other modern apes. I say 'orangutans' because there are two distinct modern varieties that are listed as separate species by Groves (2005), the Sumatran Pongo abelii and the Bornean P. pygmaeus. During the Pleistocene, orangutans were also found in continental south-east Asia and southern China (Bacon & Long 2002). Previous to the Pleistocene, however, a gap of six or seven million years separates Pongo from their generally accepted relatives in the Miocene genera Sivapithecus and Khoratpithecus (Finarelli & Clyde 2004; Chaimanee et al. 2004). Other possible pongine genera whose position is less firm include Lufengpithecus, Ankarapithecus and Gigantopithecus. In the phylogenetic analysis by Finarelli & Clyde (2004), the Miocene Lufengpithecus and Ankarapithecus were initially placed on the orangutan stem on the basis of morphology, but switched over to the base of the stem of the African ape-human clade under an analytical method that attempted to reduce stratigraphic incongruence. 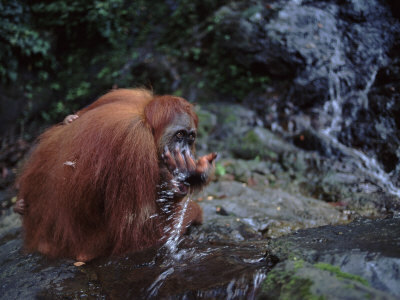 Sumatran orangutan Pongo abelii drinking while neatly concealing its baby. Photo from here. Sivapithecus is the best-known of the fossil pongines, with a number of species assigned to it from India dating from about 12.8 to 7.4 million years ago. Though Sivapithecus was similar to modern orangutans in skull morphology, it differed in its dentition and postcranial morphology. Sivapithecus lacked the adaptations for brachiation of orangutans; when moving in trees, it would have run along the top of branches in the manner of a monkey rather than swinging underneath the branches like an orangutan. Arm-swinging was probably a later innovation on the orangutan line (and would have therefore developed independently from other arm-swingers such as gibbons). Khoratpithecus, currently known only from teeth and jaw bones, had dentition more similar to Pongo and is probably more closely related to modern orangs than Sivapithecus; unfortunately, we do not yet know whether it retained the plesiomorphic postcranial morphology of Sivapithecus. 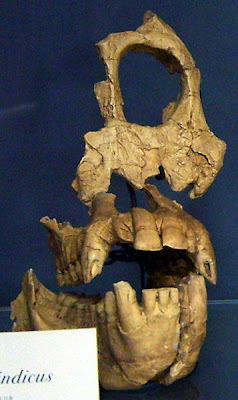 Skull of Sivapithecus indicus. Photo by FunkMonk. Ankarapithecus is a smaller ape that, as its name suggests, was found in Turkey. If it is a pongine, it would increase the known range for that clade. An even greater range has been suggested by the assignation of the Spanish Hispanopithecus to the pongine line (Cameron 1997), though it was instead assigned to a non-pongine clade of European apes by Begun (2009). As indicated above, Ankarapithecus and the Chinese Lufengpithecus show features that could be interpreted as showing relationships to either pongines or hominines. Indeed, some fossils now regarded as Lufengpithecus were initially assigned to Homo (Harrison 2002), though possibly that may say more about the expectations of Chinese palaeoanthropology than about Lufengpithecus itself. 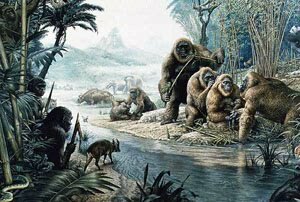 Reconstruction of Gigantopithecus herd. Image from here. The only potential pongine other than Pongo itself known from later than the Miocene is Gigantopithecus. Three species have been assigned to this genus: the Pleistocene Gigantopithecus blacki from China and two Miocene species from Indo-Pakistan (the Indo-Pakistan species were smaller than G. blacki, but still larger than most other apes). A significant time gap separates the Chinese and Indo-Pakistani species, and it has been suggested that they may represent two separate lineages that independently attained large size (in which case the Indo-Pakistani species are placed in the genus Indopithecus). Gigantopithecus blacki had the largest teeth of any known ape, but without any post-cranial remains it is difficult to know its overall size. Johnson (1979), assuming the proportions of Gigantopithecus blacki to be similar to those of a modern gorilla, suggested that it may have weighed around 270 kg (vs about 160 kg for a gorilla) with long bones about 20% longer than those of a gorilla. However, it has been suggested that the large teeth of Gigantopithecus were specialised for feeding on bamboo (Kupczik & Dean 2008), in which case it may have had larger teeth relative to body size than other apes (it is notable in this light that the incisors of Gigantopithecus were actually smaller than a modern great ape's: Woo 1962). At any case, estimates that Gigantopithecus was more than twice the size of a modern gorilla seem unlikely. Bacon, A.-M., & V. T. Long. 2001. The first discovery of a complete skeleton of a fossil orang-utan in a cave of the Hoa Binh Province, Vietnam. Journal of Human Evolution 41 (3): 227-241. Begun, D. R. 2009. Dryopithecins, Darwin, de Bonis, and the European origin of the African apes and human clade. Geodiversitas 31 (4): 789-816. Cameron, D. W. 1997. A revised systematic scheme for the Eurasian Miocene fossil Hominidae. Journal of Human Evolution 33 (4): 449-477. Chaimanee, Y., V. Suteethorn, P. Jintasakul, C. Vidthayanon, B. Murandat & J.-J. Jaeger. 2004. A new orang-utan relative from the Late Miocene of Thailand. Nature 427: 439-441. Finarelli, J. A., & W. C. Clyde. 2004. Reassessing hominoid phylogeny: evaluating congruence in the morphological and temporal data. Paleobiology 30 (4): 614-651. Groves, C. P. 2005. Order Primates. In: Wilson, D. E., & D. M. Reeder (eds) Mammal Species of the World: a taxonomic and geographic reference, 3rd ed., vol. 3 pp. 111-184. John Hopkins University Press. Harrison, T., Ji X. & D. Su. 2002. On the systematic status of the late Neogene hominoids from Yunnan Province, China. Journal of Human Evolution 43 (2): 207-227. Johnson, A. E., Jr. 1979. Skeletal estimates of Gigantopithecus based on a gorilla analogy. Journal of Human Evolution 8 (6): 585-587. Kupczik, K., & M. C. Dean. 2008. Comparative observations on the tooth root morphology of Gigantopithecus blacki. Journal of Human Evolution 54 (2): 196-204. Woo, J.-K. 1962. Gigantopithecus and its phylogenetic significance. Scientia Sinica 11 (3): 391-396. "Arm-swinging was probably a later innovation on the orangutan line (and would have therefore developed independently from other arm-swingers such as gibbons)." Interesting, as knuckle-walking also seems increasingly to have evolved independently in chimps versus gorillas. Wonder what prompted so many Miocene apes (including stem hominines) to begin developing these different modes of locomotion. I'll be a lot more impressed with Gigantopithecus reconstructions when cranial and post-cranial remains are found. And bipedal terrestrial walking seems to have evolved at least twice too (in Oreopithecus and in the human lineage, respectively). Lufengpithecus may have persisted to the Pleistocene as well. Teeth from China dating to around 1.9 Mya were originally assigned to Homo, but have since been reassigned tentatively to Lufengpithecus. This marks one of the very few cases where a paleoanthropologist has claimed one of his own finds to be a human ancestor but later recanted. Is there any non-dental remains of "Indopithecus"? 'Indopithecus' is represented by perhaps the best mandible for Gigantopithecus sensu lato, but that's all so far (the provenance of the mandible is a little uncertain as well, due to it's having been used as part of a retaining wall for a while).